"Mr. Stone, from his tangled hair to dirty feet, has taken himself and his story into the beyond - way, way beyond." "THIS IS AN AMAZING FILM that announces the arrival of a groundbreaking new voice." "'SEVERED WAYS' IS A VISIONARY WORK from one of the most promising new American narrative filmmakers in recent years. A chest-thumping, head-pounding, axe-wielding tromp through the wilderness, 'Severed Ways' is the unexpected, frankly unsolicited cinematic spawn of Werner Herzog and heavy-metal album cover art. But rather than parody, the film is a sincere valentine to leaden dramatics and brute manliness, a paean for a simpler, sillier, hairier historical moment. Director Tony Stone's stroke of strange genius is to conflate metal culture with its favored pagan iconography, asserting a continuum between unkempt warmongers and sweaty head-bangers." "SOME OF THE RAWEST, MOST REALISTIC, DEEPLY PERSONAL INDEPENDENT FILMMAKING I HAVE EVER SEEN. It completely encompasses the true metal spirit." "What more could any person want in a single movie?" "As with any nominal grouping, some of the films are good, some are bad, most are god-awful, so it's a pity this lot's making all the waves as I much prefer the full-bore DIY ethics of Tony Stone, who not only took paltry funds and turned out a viking epic called Severed Ways: The Norse Discovery of America, but did so by ditching out of NYC and living the Norse lifestyle in Vermont for long stretches over a couple of years. Stone stars as one of the pair of lost vikings, directs, kills and cooks a chicken, terrorizes a monk, burns a church (that he built himself), and even has a healthy bowel movement on camera. Do it yourself, indeed." "Like an art metal album abruptly but successfully segueing from low-end riffing to Brian Eno-esque ambience, director (and co-star) Tony Stone's Severed Ways bounces between Malick-esque patience and pulpy, in-your-face bursts of ugliness. The result is one of the most bizarre and strangely moving films of the past bunch of years. And the film's artfully jagged merger of opposites extends to its creation too." "Herzog has found a kindred spirit in Tony Stone, and this is probably the only film I can immediately think of in which the great German director's cinematic sensibility has been sustained and not merely homaged." "It's a film with all of the scuzzy low-fi energy of something released by Death Like Silence in the early 90's yet with less than five minutes of dialog manages to express more than most art films could ever possibly hope to. A deceptively simple movie. Stone's film is also one of the most beautifully shot pictures I've seen in recent memory. Substantially hindered by budget, Severed Ways frames just about every single shot with as much of the North East's natural beauty as possible. Severed Ways is historical fact filtered through the eye of Frank Frazetta and then passed through the lens of Werner Herzog. It's a remarkable film that is not for everyone. Stone's film represents a new wave of indie that drives productions costs down while celebrating creativity and ideas. It is the absolute antithesis of contemporary indie, which many filmmakers use as a gateway to Hollywood rather than a means of maintaining total control. In a time where style over substance is gaining more momentum than ever, it's nice to find a film that holds art and storytelling above everything else." Let's suppose I owned a fancy machine: one that could, with just the touch of a button, transform a song into a film. After turning 'Surf City' into 'Beach Blanket Bingo,' 'Heroin' into 'Trainspotting,' and Beethoven's Ninth Symphony into 'Smokey and the Bandit,' my eyes would drift toward my brother's black metal collection, and I would start to feed my contraption glorious Nordic wrath. The picture that would emerge would be 'Severed Ways - The Norse Discovery of America.'" "Stunning and masterful debut film, . . .pulse pounding, hypnotic piece of work. Stone has the eye of Ridley Scott and the visual tapestry of Stanley Kubrick." ""Severed Ways" Impressive and also absolutely ludicrous, this is the movie you need to recommend to that suburban metalhead cousin in desperate need of having his mind blown. " "Immersive, textural, ambient, and, in its enjoyably ridiculous way, not kidding. I can't wait to see what he'd do with the Pilgrims." "Yet what Stone does choose to focus upon always turns out to be visually fascinating. Like the very best outsider art, there's an obsessive quality to Severed Ways – an intensity and insistence to Stone's eccentric vision that shines through nearly every frame. The film exudes a sense of mad conviction, and, to its credit, Severed Ways is never really predictable." ***1/2 (3.5 stars) "Severed Ways the survivalist counterpart to John Waters' Pink Flamingos. But there's a dark, offhand undercurrent of humor alongside the heavy-duty naturalism. a director to watch, even if to go berseker for it you'd have to enter the theater under the influence of bog myrtle." ""Pathfinder" meets "Gerry" in "Severed Ways: The Norse Discovery of America," a striking and virtually wordless story of two Vikings separated from their tribe and left to stumble through the North American wilderness. Blending heavy metal and opera, first-time director Tony Stone unlocks a previously unexplored connection between head-bangers and Vikings, creating...an idyllic meditation on primitive man overwhelmed by his surroundings." "Orn (played by writer/director Tony Stone) celebrates by headbanging to some heavy metal on the soundtrack. His long blond hair flutters in a slow motion cloud that obscures his face as he totally rocks out. If Frank Frazetta was a metal-head movie director, he would have filmed this scene. This moment captures the spirit of "Severed Ways" better than any other. Ancient Vikings meet modern music (and modern digital technology) in a film that's...different. It's certainly a whole world away (or at least a thousand years away) from the American indie formula story about quirky outsiders doing quirky things as they form quirky relationships and learn bittersweet (and quirky!) lessons along the way. As a film critic who has had to sit through far too many of these twee indies, let's just say that in my fantasy movie Orn meets up with the characters from "Juno" or "Sunshine Cleaning," listens intently to their problems, and then cleaves right to the heart of the problem, Viking-style. "Severed Ways" exudes a specific and unique vibe, and you're either going to get into it or you're not." 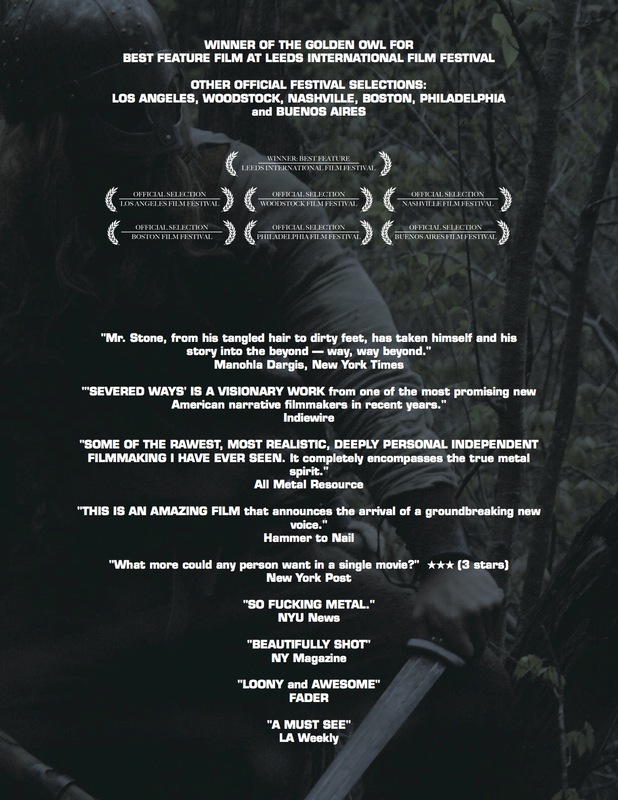 "Severed Ways is beautifully filmed, ...Stone makes poetic use of the natural surroundings...the most believable Vikings-vs-Indians story I've ever seen, and it's a damn good first feature that reveals a director with a good eye for both grand vistas and personal moments." "Director Tony Stone makes the wise choice in Severed Ways of making the terrain of the world a character in this story. The beautiful majestic vistas of wood and mountainside and shoreline are breathe-taking and shot with great care, almost homage. In fact, it is the landscapes photograph that does te heavy-lifting for this film, imbuing it with its best production values. That beautiful is cleverly juxtaposed against the harshness of raw nature and the strength required to survive in." "SEVERED WAYS: THE NORSE DISCOVERY OF AMERICA rocked. And the beauty of the metal doesn't end there. It is woven into the story. invites the viewer in to this beautifully shot, mesmerizing film." "Severed Ways is a thrilling concurrence of oppositions, its disparate and unique blend of elements working together in constantly unexpected ways. Its primal, rustic story is set to a soundtrack of everything from Norwegian black metal to Brian Eno, while the camerawork encompasses both classical compositions and stylized digital techniques. It gives nods to filmmakers from Dreyer to Bergman to Herzog, while updating the subtitles for its Vikings' 11th century dialogue to colloquial English. ("If we stay here, we're toast.") It is somehow both deeply serious and strangely silly. First-time director Tony Stone has created a film that is steeped in cinema history and completely original, both timeless and thoroughly modern"